Intrinsic. Essential. Virtually perfect. 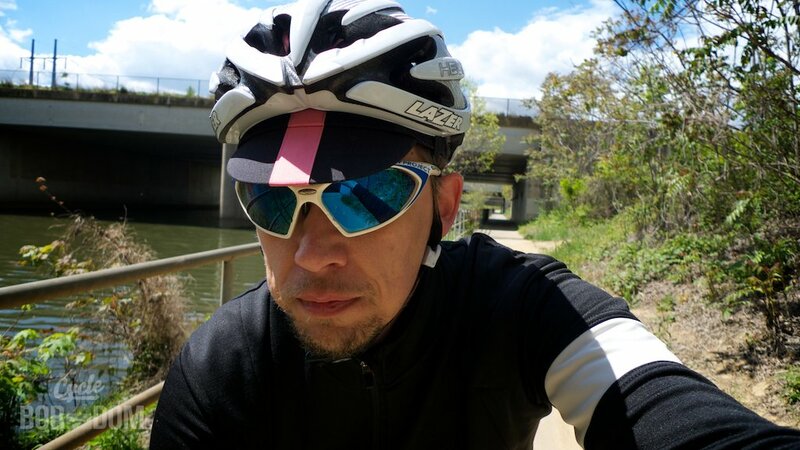 I’ve been riding the Rapha Winter Jersey for the past two winters. I looked forward to donning it this season, and lamented its return to the closet as the laatste vestiges of winter gave way to the warmth of spring. When my purchase arrived from abroad, I was pleasantly surprised by the heft of the parcel. The mental expectation derived from the word jersey is not a substantial one. Even knowing the Winter Jersey was crafted of wool and wind-defeating materials, I still lowballed. Once I opened it, I was floored. This, is one substantial jersey. Thick lofted merino wool, panels for wind protection, deep, strong pockets, and fine appointments throughout. Its classic, minimal demeanor is shattered by the sheer amount technicality bubbling beneath the surface. 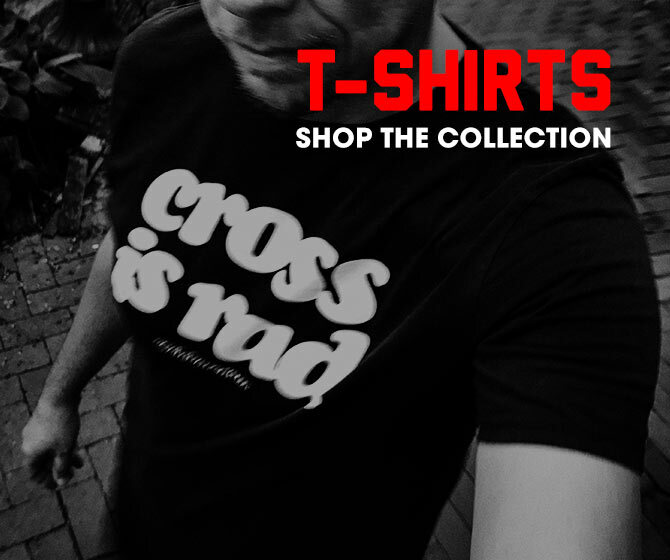 While technically not designated Classic, as a long-serving member of Rapha’s lineup, it probably should. The single white arm band, script logo, and pink accents firmly entrench it in the visual tradition of Raphaism. As with all Rapha products, or at least the ones I’ve tried, it’s a tailored fit. It sits along the shoulders nicely, and wraps your chest and torso in a manner that diminishes the hulking mass contained beneath. 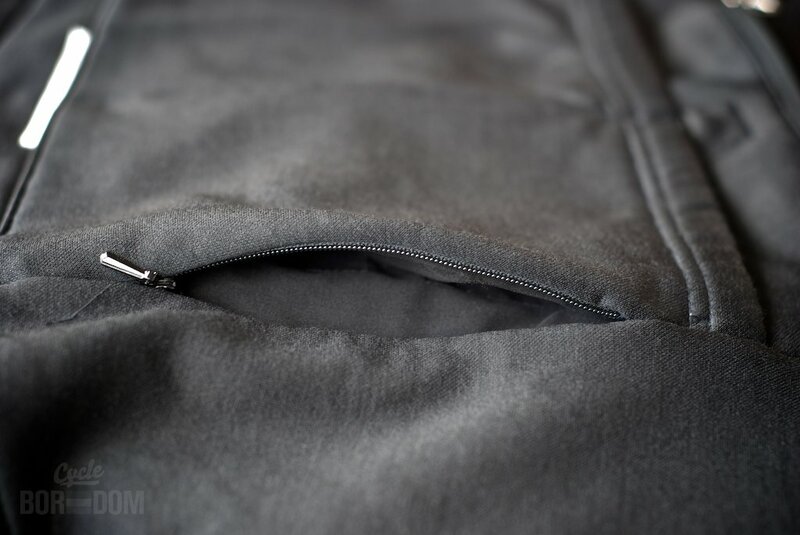 When zipped, the front lies flat across your chest without any bulging or protrusions. The sleeves have a bit of room built into them, which at first, was a bit odd. 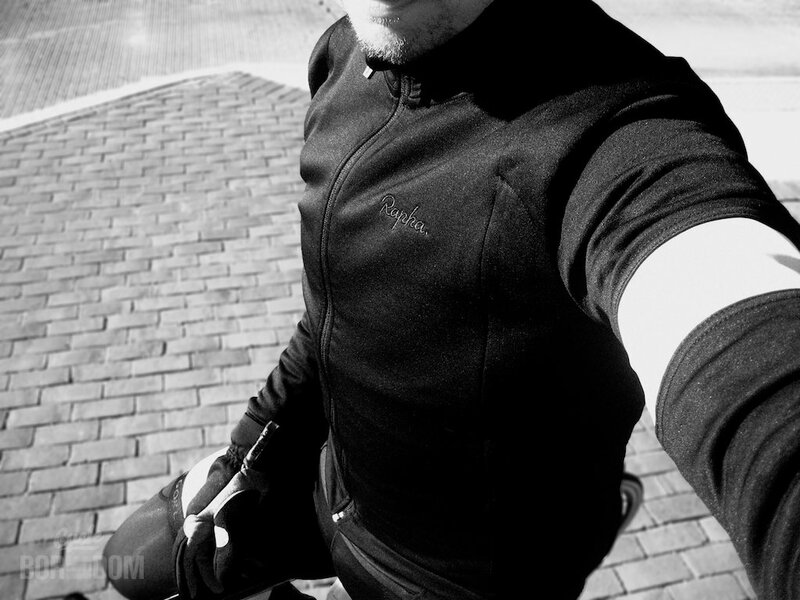 But as I rode the jersey deeper into the colder, sunless months I was elated that armwarmers were able to fit comfortably underneath. Minimal from the outside, technical on the inside. 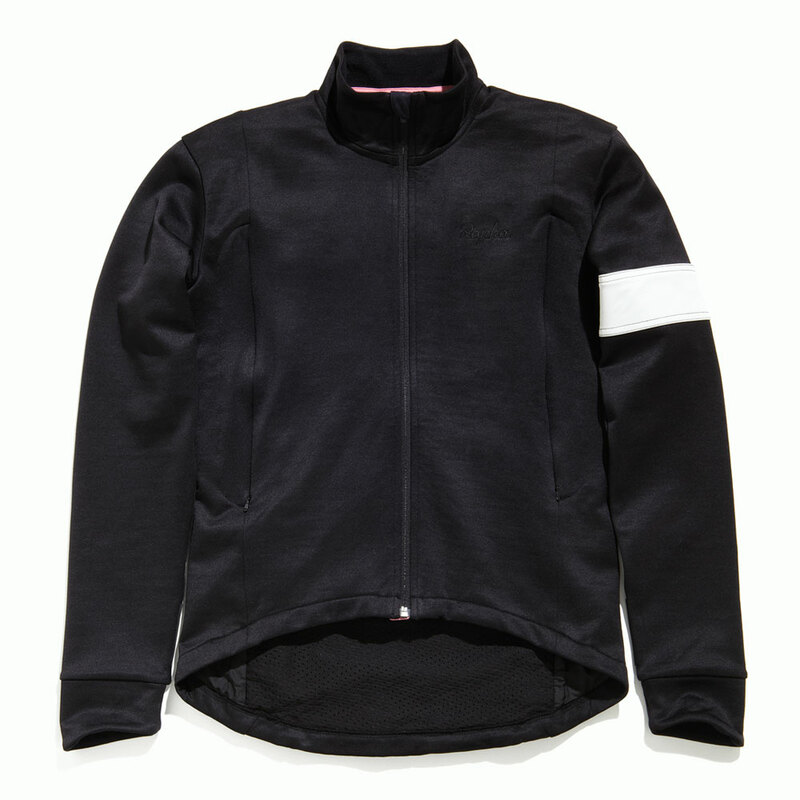 The beauty of the Rapha Winter Jersey is that its technical attributes aren’t screaming at you like so many others. Windproofing is handled by panels sewn to the inside of the piece, rather than the outside. Nothing, save the traditional white armband fashioned from reflective material and reflective piping on the cuffs and tail break its minimal visage. 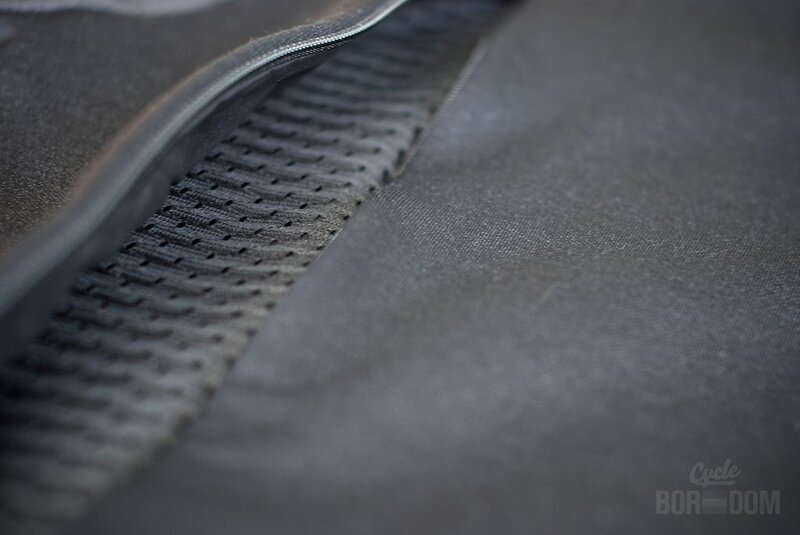 Zippers are sewn in an effort to seem invisible, yet easy to grasp whilst in motion. Those that are visible are styled in a manner befitting of the rest of the piece. Large vents are positioned to the front of the jersey. Unlike “pit-zips”, these seem to gulp air rather than merely venting stored heat/moisture. The vents are easily regulated while moving which isn’t always the case with cold weather gear. The Winter Jersey is ripe with cavernous rear storage. 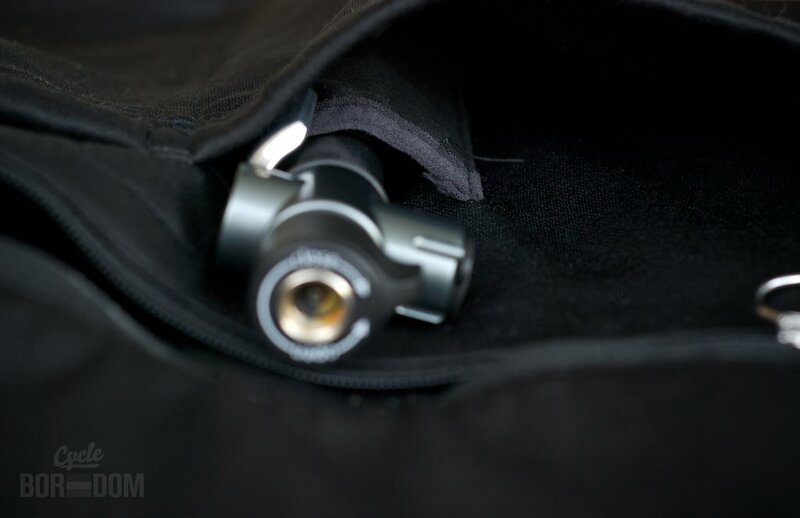 There are two traditional main sections accentuated with a pump holster and zippered side slot, as well as a massive zip-enclosed compartment capable of portaging discarded layers. I’ve filled these beyond rational amounts, and they’ve never complained. Besides the opportunity touched on below, the storage feels as strong as the day I received the product. My only criticism about this piece, and several other Rapha products I own, is the finishing. As a general rule, a cycling product at this price range should be perfect. 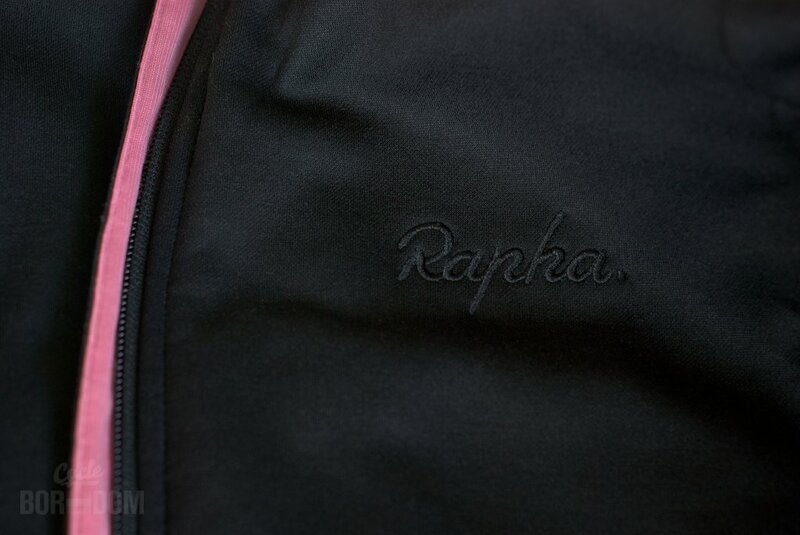 As for a product from a company like Rapha, it has to be perfect. I know it’s still an article of clothing put together by humans running machines, but so are the other brands out there. I have many products I’ve used for years, and they’ve shown no predilection for loose stitching. Luckily, the only failure has been the hidden message Rapha’s products are known for. 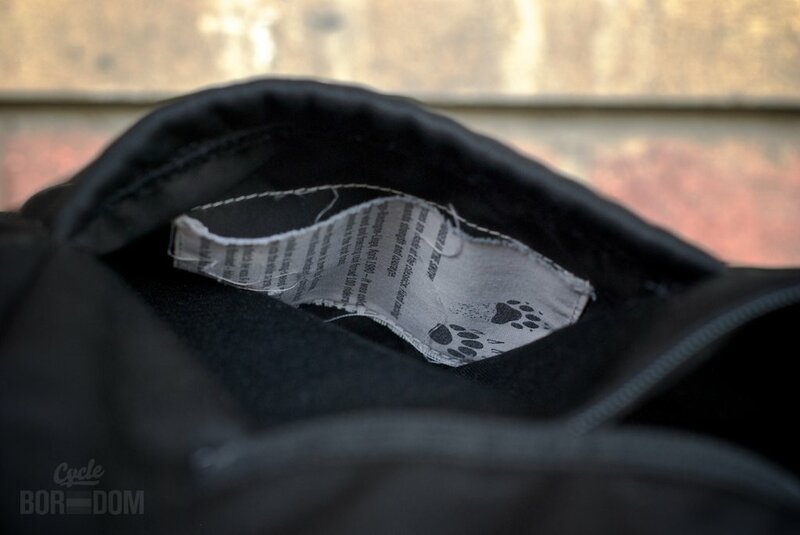 Located in the right rear pocket, the stitching for the tag regaling us with tails of Le Badger’s #LBL exploits, was too close to the edge and I tore it while filling my pockets. As for the other stitches you may have noticed in the images above, they’ve stayed the same. This jersey is rugged and structurally sound. The Rapha Winter Jersey’s command of style and fit kept it on alert “go-to” status for the past two seasons, even when it might’ve not been hygienically sound. The outside is still as clean and visually uninterrupted as it was when I purchased it. The interior lofting is only slightly pilled despite copious usage and machine washing. Aside from the cosmetic, yet hidden, stitching issue this garment is a fantastic 3-season piece. PRO FACTORS: Timeless style, broad condition range, and sartorially superior fit. RATING: 95% – Finishing could’ve dropped this to 90%, but its high demand status keeps it at 95%.